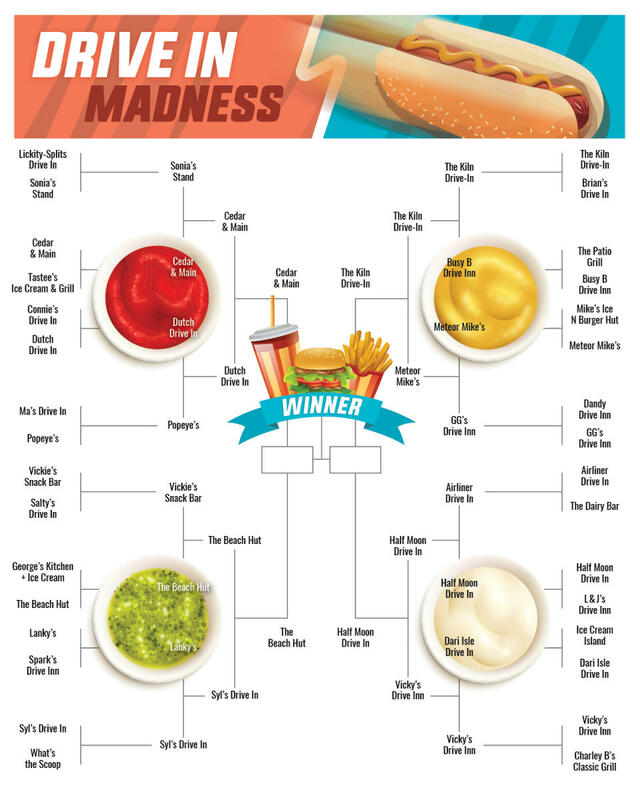 This is it: the semi-final round in Drive In Madness! Last night&apos;s round had us on the edge of our picnic table seat as Cedar & Main just narrowly surpassed the famed Dutch Drive In with 50.6% of the vote! Before we say goodbye, did you know that the Dutch Drive In is one of the few drive ins left in the province where carhops serve right to your car window? They even have those nifty trays that attach! Meanwhile in another close vote, Killarney&apos;s Beach Hut squeezed out as the winner of the Relish Division, leaving Syl&apos;s Drive In (which, FYI is one of those most popular motorcycle day trip destinations from Winnipeg) to eat crumbs. While the sweet summer town of West Hawk Lake fought hard and true, ultimately it was the strong and sturdy Kiln Drive-In of Stonewall that claimed a spot in the final four. And lastly in the Mayo Division, the fabulously retro Half Moon Drive Inn rolled triumphantly past the humble Vicky&apos;s Drive Inn - which by the way, you simply must stop into to try the onion rings. We&apos;re getting down to the nitty gritty now - voting closes tonight (March 27) at 11:59 PM!